I originally hoped to have my "Best of 2016" video up and open yesterday, but YouTube had the video removed for some sort of terms of service violation. 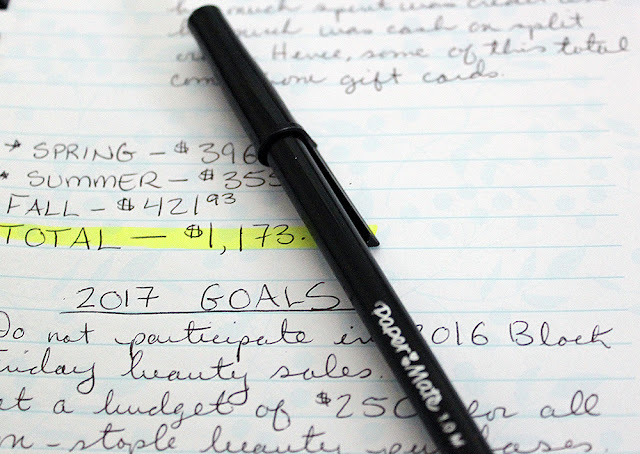 My appeal still hasn't been considered, so I'm posting about my goals and beauty budget for 2017 instead. This past year, I kept track of all of my beauty or beauty-adjacent purchases in a little notebook. I noted what I bought, when I bought it, what it all cost, and how I paid for it. Unfortunately, I didn't develop the best documentation strategy until these past few months. Hence, spring and summer orders that I paid for with both store credit/gift cards and cash don't differentiate between how much of each was spent. Therefore, the "total cash spent" for spring and summer is a little inflated. I did not include products bought with just store credit or gift cards in these calculations. Also, I subtracted the cost of products I returned. Wow. Even if you subtract about $200 from the total to account for gift cards, that's a thousand freaking bucks. Now, I'm not judging anybody for spending that much, and I'm not even judging myself. I pay my bills every month, I put money on my student loans, I maintain a savings...but still. That's a lot! I imagine how much quicker I could pay down my loans with that money, or how fantastic it would feel to make bigger charitable donations. On the bright side, a decent slice of what I spent accounts for repurchase staples, and I found some amazing new products over the year. I've also noticed that I've skipped over the last few sales that popped up, and I'm not too interested in the current Black Friday offerings, either. All I bought from Sephora VIB? 2 staple products, 2 new products, didn't even crack $100. Every time I see a product on sale, even if it's something I think I'd love, I look at my collection sitting next to me on the desk and say, "Eh, I already have _____ lipsticks." I feel great about that. God bless the wedding budget template in Excel. Set a budget of $250 for all non-staple beauty purchases. Staples I'll just purchase as needed. That sounds like cheating, I know, but staples aren't products I tend to overpurchase. I think we all know the ol' standbys are beloved for a reason, but they don't make your heart beat faster. Unsubscribe from Sephora Play. I actually think it's a great service, I just have tons of deluxe samples and newer products to work through. Complete at least one more Project Pan/Beauty Roulette during the year. I'll probably take a break at the start of the year, though. Do a new edition of the Lipstick Diaries. This series was really helpful for me in 2016, and a lot of people seemed to enjoy it! Transfer more funds to my savings, student loan payments, and charitable donations. Again, I already pay for these things, but I think being even more focused will really encourage me to spend less on beauty products. And speaking of charity, I want to thank everybody who has contributed to Donors Choose as a thank you for this blog. I appreciate your support, as always, but even more, I appreciate your support of our educational programs. It really is terrifying how sneakily it adds up...I feel as if I've been sooooo restarained and then I remember I'm Rouge again however I only shop at Sephora with an occasional jaunt to Nordstrom (can't stand Ulta they never have product in stock and the sales people are clueless about product details or new releases). $25 here, $40 there...and when you do the math, BOOM. I'm sorry that YouTube removed your video. Do you have any idea why they thought it violated the TOS? I'm guessing because I had links to reviews for the products in the description. 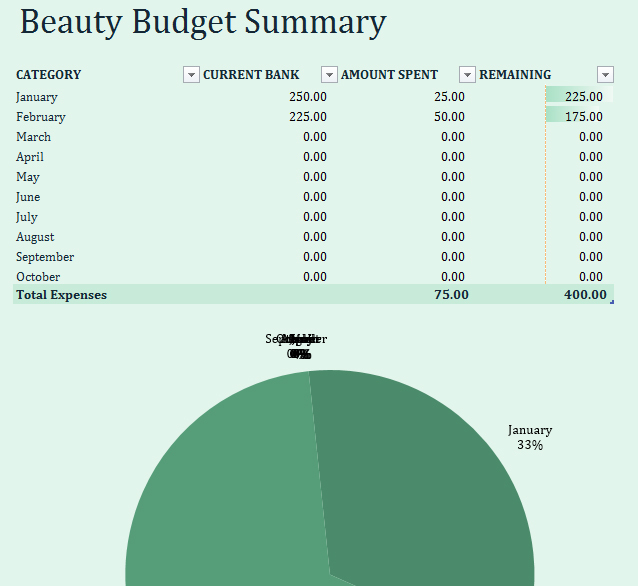 I've never tried to track my beauty spending and I'm kind of scared to, even though I know it's a good idea. It probably wouldn't be *that* high, but I only make $0.60 above minimum wage so it's all relative. I don't think purchasing staples is cheating at all! You'll need them anyway. It's all the extra stuff that really gets us, isn't it? Good luck with your 2017 beauty spending goals! can you be my personal accountant?? I don't think anybody wants an English teacher to do that work for them, but do check out the Microsoft Excel templates!